The first readings of the liturgy this week give daily segments of the 42 chapters of the Old Testament Book of Job, well-chosen to convey the message of the entire book. Job is a good man who has everything then loses everything: wives, children, land, livestock and health. This leaves Job in the depths of suffering desperate to find meaning in his anguish. Much of the book involves some of Job’s friends suggesting to him that his suffering must be a punishment for his sin. But Job knows that this is not the case. The book ends with Job in new depth of conversation and relationship with God. Of course Job for all his big-dreams, competence, achievement, and wealth has never thought about life with God’s perspective. He realises that what he has achieved in his little but long life is puny compared to the power and beauty of God’s creation and ongoing activity in the world. 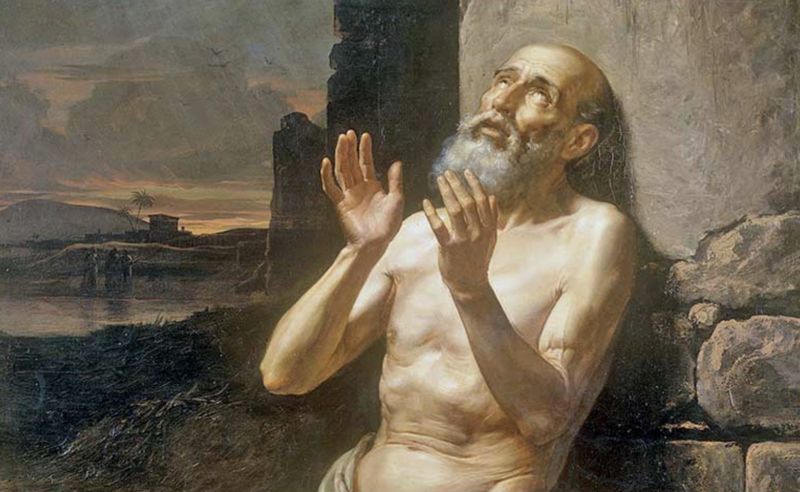 As Job listens to God he realises that his perspective is tiny and his suffering while overwhelming for him is really no reason for him to fret given the power and generosity of God who remains very close to him. But what Job does discover through this whole miserable experience of loss and suffering is that he is now in even more intimate relationship with the God who walks about in the depths of the abyss and who knows the way to the dwelling place of light. Over the next twenty-four hours allow the suffering you experience to come fully into your consciousness and prayer. There is no need to be afraid. Speak with Jesus about your suffering and allow Him to use your suffering to lead you into deeper intimacy with Him. One Response to "Job in the dung"
Sometimes I need to evaluate what I have in life. What is essential? What is importantive ? What is trivial or superficial? Does what I have make me a prisoner? Or does it bring feedom and peace? In other words, is what I have life-giving? Or is it life-diminishing? These are not easy questions but when I sit with Jesus in prayer he usually gives me the answers I need.